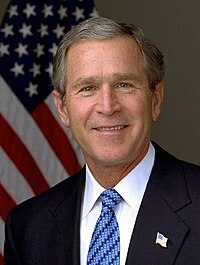 Ta George Walker Bush (ruggit er 6 Jerrey Souree, 1946) ny 44oo Eaghtyrane as ny Eaghtyrane roie er ny Steatyn Unnaneyssit. V'eh ny 46oo Kiannoort er Texas veih 1995 derrey 2000 roish haink er dy ve ny Eaghtyrane. Hie yn duillag shoh er ny reaghey er 13 Toshiaght Arree 2017, ec 22:48.